Crissy Field Ave is a crucial bicycle link that connects the Golden Gate Bridge with many parts of San Francisco. It is heavily used especially by Marin commuters heading to downtown SF. Previously. this stretch was uphill only with a lane for cars and a dedicated bike lane. Over the summer of 2018 the road was closed to cars and converted into a two-way bikeway. This was a huge improvement for all cyclists: commuters, road racers, mountain bikers on the way to the headlands, tourists riding bikes for the first time in years, etc. Everyone uses this stretch, hundreds of riders every day of the year. So it's all good, right? Not quite. The road surface is very rough and uneven, and only minimal effort was put into sealing cracks prior to painting fancy bike lanes. The result: an obstacle course for downhill cyclists that results in broken spokes and dangerous dodging maneuvers to avoid the roughest patches. I am a regular bike commuter from Marin to SF. 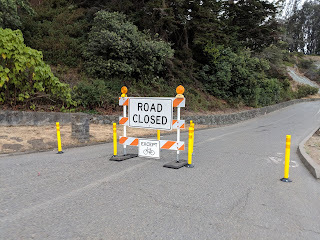 Twice a day, ~4 days a week I travel through the Presidio by bike along with many other bicycle commuters that follow a similar route. I am in general very pleasing with the conversion of Crissy Field Ave to a bike path. The car-free environment makes me feel safer, my southbound commute is now a couple minutes shorter, and I can avoid the dangerous off-camber curve at the bottom of Long Ave. However, there is a safety issue that I would like to see addressed. The poor quality of the pavement is a hazard both directly affecting cyclists traveling downhill, and indirectly impacting uphill cyclists and walkers that end up head-on with downhill cyclists trying to dodge the ruts. Just today a cyclist broke two spokes on the downhill -- it takes a lot of impact to break spokes and she was lucky to avoid crashing. Furthermore, I have personally witnessed close calls as riders try to dodge the worst parts. The minor crack filling that was done before painting might be fine for cars, but is not sufficient for our skinny tires. I would like to see this stretch properly resurfaced. It is a huge thoroughfare for bikes and could be a shining example of what proper bike infrastructure looks like. Unfortunately right now it's more of a half-done-right obstacle course.